When was the last time you approached any of your adult children with a question regarding your smartphone, tablet or computer? And what was their usual response? "Sorry, mom, dad. No time. I have work deadlines to meet." 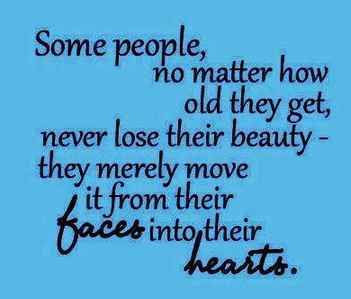 So you turn to your grandchildren. 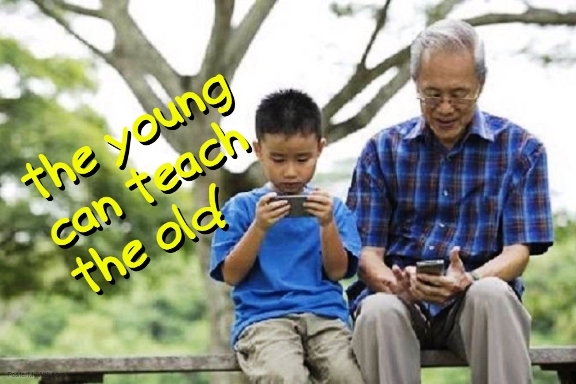 After all, they grew up in the internet age and are wiz kids when it comes to electronic devices. 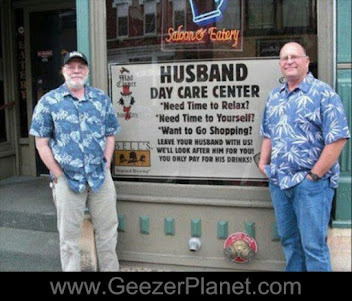 They are happy to teach you. Unfortunately their enthusiasm and patience don't last long enough for you to grasp their explanation. After a few minutes, they run off to play or do their own thing. It's true - family members often make the worst teachers and also the most difficult students, whether it's about learning to drive, play a musical instrument or use multi-media. 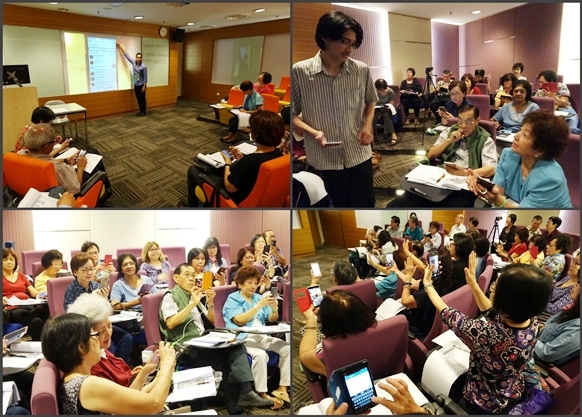 So you can imagine how excited we were when Dr Teh Pei Lee agreed to collaborate with SeniorsAloud to organize a workshop on smartphone usage specially for our members. Dr Teh is Associate Prof from the Dept of Management, School of Business at Monash University Malaysia. She is also Head of the Gerontechnology Lab, as well as Chair for IEEE Technology and Engineering Management Society (TEMS) Malaysia Chapter which would be sponsoring the workshop.The facilitators for the workshop would be her students from the School of Business. 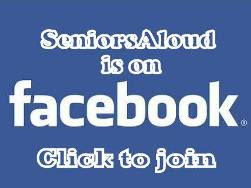 The workshop would be the first inter-generational event for SeniorsAloud. And who better to teach our members about smartphones than a team of young students who are also research assistants at the Gerontechnology Lab that we would be visiting after the workshop. 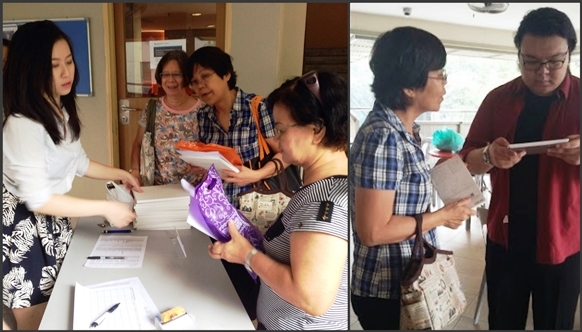 Early birds at the registration counter getting their goody bags and workshop manuals from facilitator Venise Lam Chi Ying and Chong Kaixiang. 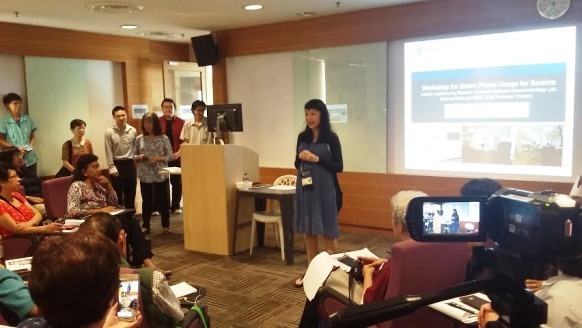 The workshop took place last Sat 23 April, 2016 at Monash University Malaysia, School of Business. 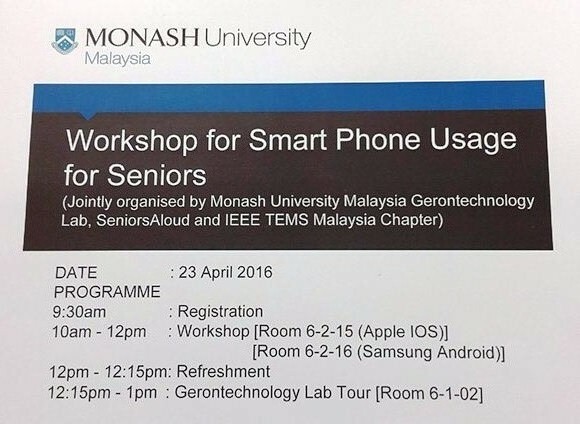 A total of 60 SeniorsAloud members had registered for the free workshop. Everyone was given a goody bag of door gifts as well workshop manuals. The event turned out to be of mutual learning benefit to both generations. The student facilitators discovered that teaching seniors was more challenging than they had initially thought. The manuals had to be printed in large font size, with easy-to-understand instructions. Brought up in the analog age, the seniors had plenty of questions to ask. Some had problems following the explanations. But Jeffery Yeow Teh Thiry, Jonathan Shakesh Kee, Venise Lam Chi Ying, Chong Kaixiang and Yip Wai Luen rose to the challenge. They proved to be excellent facilitators handling the participants' numerous questions with lots of patience and tact. 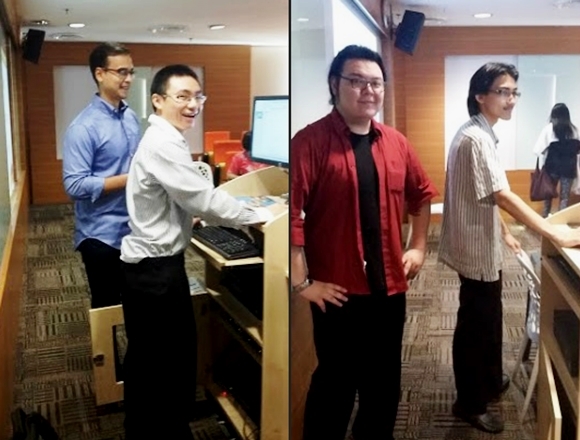 (Right) The facilitators for Android users: Chong Kaixiang and Jeffery Yeow Teh Thiry. Both IOS and Android sessions ran concurrently. It was interesting to note that Android users outnumbered iPhone users 3 to 1. Those who were already familiar with the above tasks took the opportunity to build on their existing knowledge of smartphone usage. The facilitators were there to guide them and answer their questions. After the smartphone workshop session was over, participants enjoyed a tea break before making their way to the Gerontechnology Lab, the first and only one in Malaysia to date. 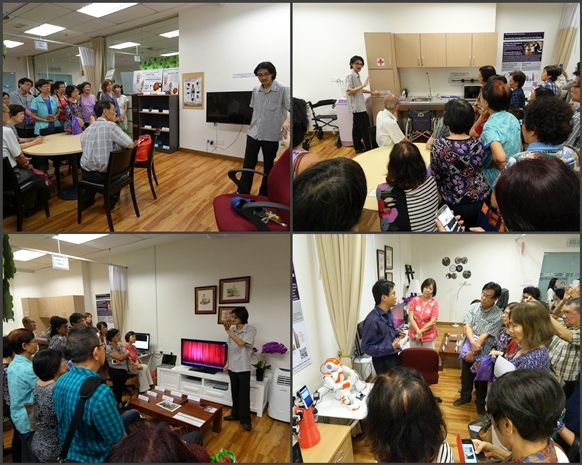 For SeniorsAloud members, it was certainly an honour and a privilege to be the first group of senior citizens to visit the lab. 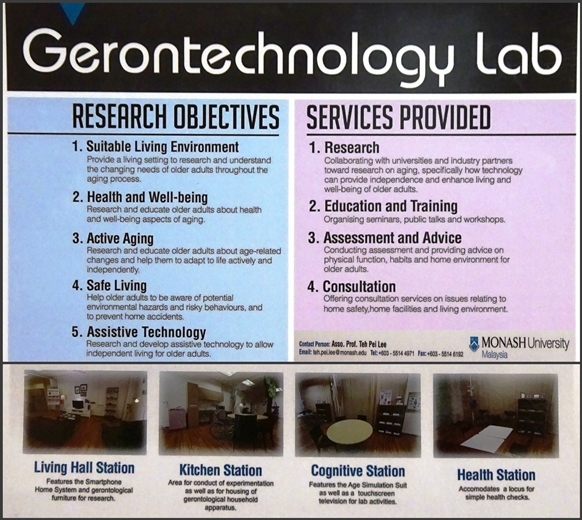 The Gerontechnology Lab was launched on February 18 to conduct research into developing technology that would help the elderly remain independent in their home. It is a collaborative effort between the schools of Business, IT, Health Sciences, Medicine, Arts, Social Sciences and Engineering, and jointly funded by Khind Starfish Foundation, Monash University Malaysia and the Ministry of Science, Technology and Innovation (MOSTI). Final year Business and Psychology student Jeffrey Yeow Teh Thiry briefing participants in the lab. Jeffery demonstrating the appliances on display at the stations. 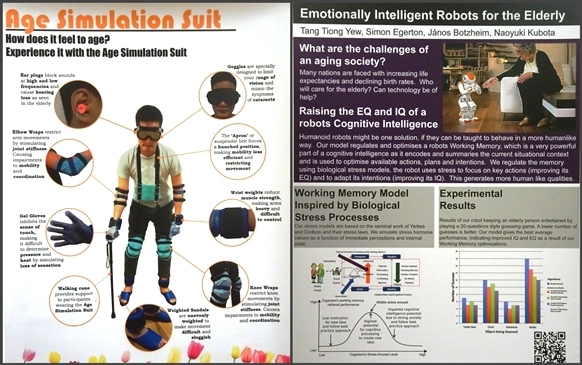 PhD student Tang Tiong Yew explaining his project - the emotionally intelligent robot. The Age Simulation Suit that enables the wearer to experience what it feels like to be an old person. The Emotionally Intelligent Robot is designed to interact with the elderly living on their own. 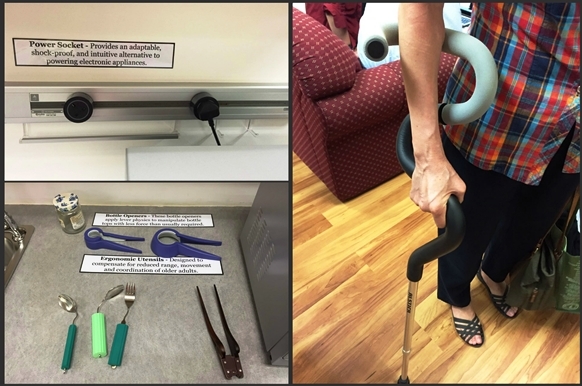 A close-up of some of the assistive devices at the kitchen station and a customized walking stick that gives the elderly a firmer grip and better balance when walking. Dr Teh speaking with one of the participants. On the table are the various components of the smartphone home system that the research team is currently working on. 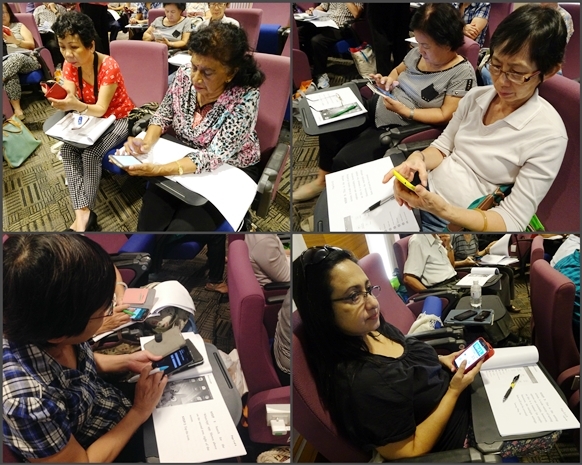 The Gerontechnology Lab research team led by Associate Prof Dr Teh Pei Lee is currently conducting a multi-discipline study on developing a smartphone home system for the elderly. They are inviting volunteers aged 50 and above to participate in a questionnaire and interview session. The session will take about 40 minutes and will be held on weekdays at Alzheimer's Disease Foundation Malaysia (ADFM) at 6, Lorong 11/8E, PJ. 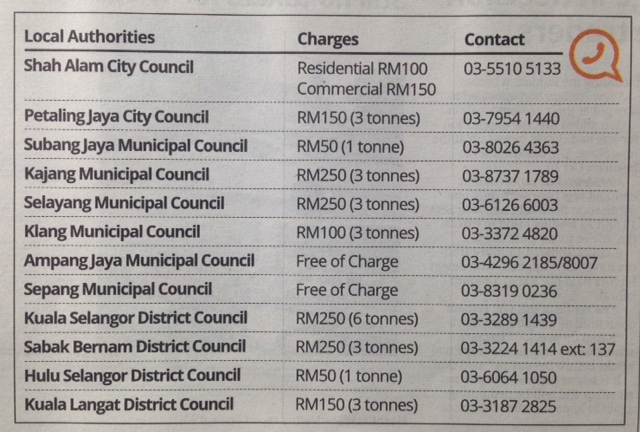 As a token of appreciation, each volunteer will receive a AEON voucher worth RM10. If you would like to volunteer for this meaningful research study, please contact Jenny at 016-608 2513 or 03-7931 5850 to arrange for a suitable date and time.